Should be used for work positioning only or be used in conjunction with a full-body harness to pr..
Security Lightweight, durable polyamide webbing for all day comfort and dependability. The blac..
Thbis Rope Restraint Lanyard has a 12mm polyamide rope lanyard with loop and a screwgate karabine.. This Rope Restraint Lanyard has a 12mm polyamide rope lanyard with loop and a screwgate karabiner..
Full body harness 1 Point (rear anchorage) Duraflex harnesses conform to the shape of ..
Made of a highly resistant and durable 23mm polyester webbing. 2m webbing shock absorbing lanya..
2.8m Miller Scorpion personal fall limiter with snap hook and swivel scaf hook. Light and comp..
MightyLite fall arrest block 6.2m - Galvanized wire Self-Retracting Lifeline Heavy-duty perform..
Miller Duraflex 1-Point harness with rear anchorage 1.75m Lanyard (sewn into the harness) c/w s..
Multipurpose galvanised steel screwgate karabiner Opening = 17 mm Complies EN 362 class B ..
Aluminium double action scaffold hook 63mm opening EN 362 class A .. Ensure your entire workforce is safe and protected from falls with our wide range of fall arrest equipment. From hook connectors to full scaffolder’s kits; Manchester Safety Services provides all of the equipment necessary to protect the workforce. All of our fall arrest items have been rigorously tested to ensure that they are strong, durable and retain efficacy after every use. Expertly crafted from high quality materials, all of our pieces are ergonomically designed to marry strength with ease-of-use. Our range of 1-point harnesses are made from lightweight, unobtrusive and durable polyamide webbing for all day comfort and dependability. 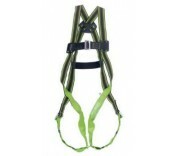 All of our harnesses have built-in D-ring sliders to customise to the shape and size of the wearer ensuring that all members of the workforce can benefit from the safety harness. Additionally, we stock the Miller Duraflex Scaffolder’s Kit which includes everything that a scaffolding professional will require to safely and effectively erect and dismantle scaffolding. Individual pieces such as hook or screw connectors can help complement the set. All of our pieces of fall arrest equipment adhere to all health and safety requirements and have been supplied by tried and trusted brands. Manufactured with many years’ of experience, the fall arrest pieces have been designed to ensure that any falls are arrested as safely as possible, minimalizing the risk of incurring further injuries. If there are any pieces of fall arrest equipment that you cannot find here, please contact our dedicated sales team and we will endeavour to help you wherever possible.